Herbert Longsdale Wilson was born on 18 September 1894 in New York. William Simpson Wilson and Kate DeYoung appeared in the US federal census of 1 June 1900 in Buffalo, Erie County, New York, at 30 Maywood. Other members of the household included Herbert Longsdale Wilson, Ida Jeanette Wilson, Grace M. Wilson, William Edward Wilson, Hannah Heath Wilson, Kate R. Wilson, Charles A. Wilson and Harriet C. Wilson. Daughter Grace also is enumerated in the household of her sister Margaret Devine. William Simpson Wilson and Kate DeYoung appeared in the US federal census of 15 April 1910 in Buffalo, Erie County, New York, at 153 Howell Street enumerated next to daughter Ida Chapin.. Other members of the household included Herbert Longsdale Wilson, William Edward Wilson, Charles A. Wilson and Harriet C. Wilson. William Edward Wilson appeared in the New York state census of 1 June 1915 in Buffalo, New York, at 153 Howell Street. Other members of the household included Herbert Longsdale Wilson, Kate DeYoung, Charles A. Wilson and Harriet C. Wilson. He was employed at plumbing, according to the 1915 census. Herbert Longsdale Wilson registered for the draft on 5 January 1917 in Erie County, New York, while single and living at 153 Howell Street in Buffalo, and employed as an electrician's helper in Tonawanda. He served during World War I, according to the 1930 census. He was employed by a factory as a salesman, according to the 1920 census. He married Ida E. Sickler, daughter of Arthur B. Sickler and Venus L. Pooler, on 4 March 1921 in Cuyahoga County, Ohio, with Rev. William W. Bustard officiating. Herbert Longsdale Wilson and Ida E. Sickler appeared in the New York state census of 1 June 1925 in Buffalo, Erie County, New York, at 2055 Niagara Street. Other members of the household included Virginia L. Wilson. He was employed by Pennsylvania Railroad, according to the 1925 census. Charles John DeVine and Margaret Blanche Wilson appeared in the US federal census of 1 April 1930 in Buffalo, Erie County, New York, at 13 Hartman Place. Other members of the household included Herbert Longsdale Wilson, Francis W. DeVine, Lester Charles DeVine, Ruth E. DeVine, Edward J. DeVine and Kate DeYoung. Herbert's wife Ida is enumerated in Cleveland, and daughter Virginia is enumerated in Buffalo with her maternal grandmother Venus Sickler. He was employed as a railroad clerk, according to the 1930 census. He and Ida E. Sickler were divorced sometime between 1930 and 1934. He married Alice M. Cheesman, daughter of Frederick George Cheesman and Alice Ellen Anscombe, on 8 November 1934 in Marion County, Indiana. The following appeared on 29 May 1947 in the Lockport Union-Sun & Journal: Dr. and Mrs. Herbert L. Wilson, 389 East Ave., left this morning for Cleveland, where they will spend the week-end with Dr. Wilson's daughter and granddaughter, Mrs. Charles Eastabrooks and Colleen. The following appeared on 1 August 1950 in the Lockport Union-Sun & Journal: Dr. and Mrs. Herbert L. Wilson of 389 East Ave. announce the birth of a daughter, Kathy Jean, July 31 at Lockport City Hospital. The following appeared on 19 December 1950 in the Lockport Union-Sun & Journal: Dr. and Mrs. Herbert L. Wilson have changed their residence from 389 East Ave. to 310 East Ave. The following appeared on 3 July 1953 in the Lockport Union-Sun & Journal: Dr. and Mrs. Herbert L. Wilson and daughters, Kathy and Debbie, are leaving today to visit his daughter, Mrs. Charles Estabrooks of Cleveland, O. 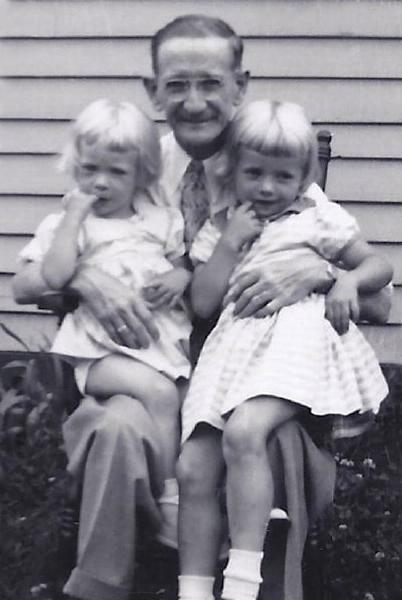 The following appeared on 7 July 1958 in the Lockport Union-Sun & Journal: Dr. and Mrs. Herbert L. Wilson and daughters, Kathy and Deborah, have returned after spending the weekend in Cleveland visiting Dr. Wilson's daughter, Mrs. Charles Eastabrooks, and family. The following appeared on 8 July 1966 in the Niagara Falls Gazette: (Lockport) Dr. Herbert L. Wilson, 71, of 310 East Ave., a chiropractor, was taken to Mount View Hospital today after suffering chest pains at home. Hospital authorities say he was admitted in "fair" condition. The first aid squad of the Lockport fire department used the inhalator for five minutes after they were called to his home at 10:12 a.m. The following appeared on 17 October 1968 in the Niagara Falls Gazette: ( Lockport) A local chiropractor is listed in fair condition today at Lockkport Memorial Hospital where he was taken by Emergency Ambulance about midnight after collapsing at his home. Herbert L. Wilson, 74, of 310 East Ave. complained of chest pains and the inhalator was used by the rescue squad of the fire department. Herbert Longsdale Wilson died on 8 November 1968 at age 74 in Lockport, Niagara County, New York, at Lockport Memorial Hospital. Alice M. Cheesman became a widow at his death. He was interred at White Chapel Memorial Park Cemetery, Amherst, Erie County, New York. The following appeared on 9 November 1968 in the Niagara Falls Gazette: (Lockport) A chiropractor here, Dr. Herbert L. Wilson, 74, of 310 East Ave., died Friday (Nov. 8, 1968) in Lockport Memorial Hospital after being stricken at his home. A resident here since 1941, the Buffalo native had offices at his home. Dr. Wilson was a World War I Army veteran, past commander of B. Leo Dolan American Legion Post 410, and a member of the Lockport Lions Club. He also attended St. Peter's United Church of Christ. Dr. Wilson was a member of various state and national chiropractic societies. Survivors include is wife, the former Alice M. Cheeseman; three daughters, Kathy and Deborah at home, and Mrs. Charles Eastabrooks of Euclid, Ohio; two sisters, Mrs. Margaret Devine of Buffalo, and Mrs. Annie Brown of Toronto, and one grandson. Funeral Services will be held Tuesday at 2 p.m. in the Gaul Funeral Home. Burial will be in White Chapel Memorial Park Cemetery in the Town of Tonawanda. The following appeared on 11 November 1968 in the Lockport Union-Sun & Journal: Dr. Herbert L. Wilson, of 310 East Ave. died suddenly Friday November 8, 1968 at the Lockport Memorial Hospital. He is survived by his wife, Alice M. (nee Cheesman). Three daughters, Kathy and Deborah Wilson, both at home and Mrs. Charles Eastabrooks, Euclid, Ohio. Also one grandson. Two sisters, Mrs. Margaret Devine, Buffalo and Mrs. Annie Brown, Toronto, Canada. Several nieces and nephews. Friends may call starting Saturday evening from 2-4 and 7-9 P.M. at The Gaul Funeral Home Inc., 263 East Ave. where the funeral will be held Tuesday afternoon at 2:00 P.M. Interment in White Chapel Memorial Park Cemetery, Tonawanda.